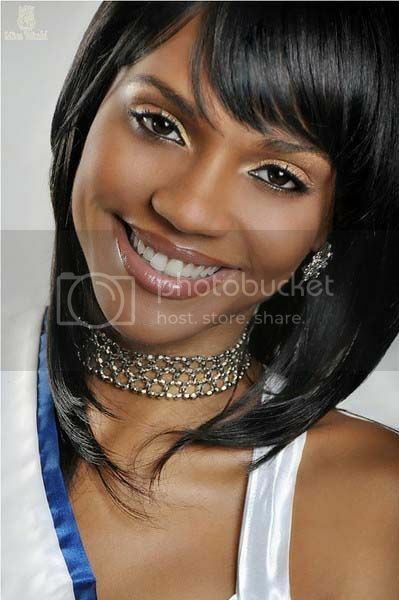 Notes: Esonica Vieira is the 1st run-up in Miss Universe US Virgin Islands 2011. Esonica hopes to complete a degree in fashion merchandising so that she can achieve her dream of one day designing and selecting fashion for Vogue. Hobbies include: dancing, singing, reading and spending time with friends at the beach. Esonica describes herself as an outgoing individual, who enjoys life to the fullest. My island is 32 square miles of fun, culture, tradition and adventure. It is blessed with beautiful beaches and great attractions, and, of course, friendly people. My future ambitions include continuing my education and obtaining a degree in fashion merchandising, pursuing an international modelling and music career and selecting fashion for ‘Vogue’. I am a charismatic, funny and outgoing individual, who enjoys life to the fullest. I am very determined to succeed in all activities I involve myself in by always doing my best. Baked macaroni and cheese is my favourite food. I love R&B music. ‘Cover Girls’ by T.D. Jakes is my favourite book. My proudest moment was winning the title, Hal Jackson Talented Teen International. I was the first and only contestant from St. Thomas. It was an honour. I can sing and hip-hop dance. I can play the steel pans. Piercing ears has become something I enjoy doing. I think it is an unusual skill to have acquired. I am able to pierce my friends’ ears for fun – I am certified!